The 3rd gen Flip UltraHD is the best yet - but is it worth the money? The Flip Video camcorder is all about ease and portability. The business model that its creators have taken with its development closely mirrors the method of refinement that Apple has long used to evolve its products. Each year there's a new Flip camera out, and it's always slightly better than last year's model. It's a good way of consistently improving a product, while also sticking to the mantra: if it ain't broke, don't fix it. This year's new Flip Ultra HD launches alongside the smaller but more expensive Flip MinoHD, and comes again packing 8GB of internal memory and has just a couple of features that distinguish it from last year's model. Firstly, the frame rate has been upped to 50 frames per second. This makes your videos a lot smoother when it comes to filming moving objects, and also when panning. The second new feature is the inclusion of image stabilisation. Because these candybar-style camcorders are designed to be held like mobile phones, footage can often be quite shaky depending on how steady your hand is, how much wind there is and so on. Digital image stabilisation smooths over shakes and wobbles during recording by using pixels outside of the frame as a buffer. So it can ignore those slight wobbles and instead insert the frames that it knows are supposed to come next. It can lead to footage looking a bit unnatural and robotic, but it certainly produces better results than if it weren't included. We found the image stabilisation to be quite effective with the Flip UltraHD, and combined with the 50fps frame rate, the quality of outdoor footage is impressive. The stabilisation is much less effective in low light conditions, though. And even in our brightly lit office, there wasn't enough light to sustain the effect. It wasn't just indoor conditions where the performance of the UltraHD waned slightly, either. The camera struggles with areas of contrast, so in shots with a bright sky and a darker foreground, the iris closes slightly and the darker area ends up too dark. It's the same the with all Flips, and there's not much you can do about it. That said, it's not a massive issue if you're only going to be shooting casual holiday footage. Of course, it's still no match for a proper camcorder, but Flip cameras have always appealed to those people who want to record HD video without forking out £500 for a fully fledged model. It's about filling a hole in the market rather than competing on features. That said, the new Flip UltraHD can hardly be labelled as a cheap product. At £159.99 it'll still take a fairly large bite out of your bank account. But on the upside, at least it's not as expensive as its slimmer, sexier sister, the new Flip MinoHD (review is incoming!) – which sports all the same features and costs £179.99. The Flip comes with built-in software for uploading straight to YouTube, Twitter or Facebook. Using the side-mounted flip-out USB connection you can plug it straight into a PC or Mac to either copy your files over or upload them directly from the device. And, as ever, it's easy as pie to operate. 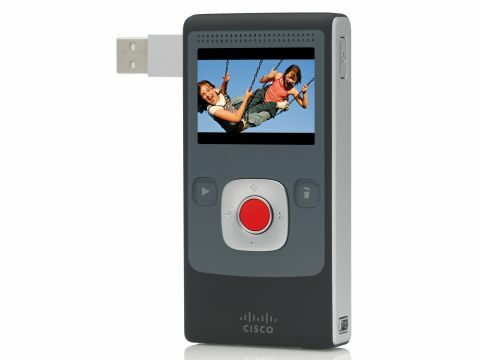 It really is a point and shoot device, with a big red button on the front. The Flip comes with a propriatary HDMI connection on the base for if you want to plug it directly into a TV. The catch here is that you must buy the cable from Cisco separately. But of a shame that, as other products from the likes of Creative bundle an HDMI cable in the box. The Flip UltraHD is a decent pocket-friendly camcorder, then. And with the higher frame rate and image stabilisation added since last year, it's definitely the best Flip yet. We still struggle to see the value there, though, especially when there are other handheld HD cameras available for a lot less.